My outfitey for SuperSale Bazaar's first day (Friday). I was SUPER excited for this 3-day summer bazaar because I just won the stall in the bloggers category which I did not expect! Usually I really pay for Anagon Collection's booth space for 6 years already on prime bazaars, that's why Supersale Bazaar and Bloggers United are special to me because I can sell my preloved garbs and promote my brand without thinking of my rent, plus as a blogger! I didn't even see the tweet announcing the bloggers who won free booths, a really nice buyer just texted me that I got in! Ang cute and that's why I love my clients so much! My ever supportive mother dear, who spent the WHOLE Friday with me! They have veggie burger, yehey for food variety Supersale! ...And very summer nautical headbands! Round and printed sunglasses from Anagon Collection, just perfect for the coming HOT months! Never a dull moment with this girl, kahit tulog natatawa ako! With the ever supportive Paul of paultheprguy.com and of course, Mich! Who gave the BIGGEST help to me and Pax during the bazaar...THANK YOU! Fun Saturday because we had LOTS of bisistas! Sarah of fashioneggplant.com and Ava of artsyfartsyava.blogspot.com came to support (with cutie Athan! 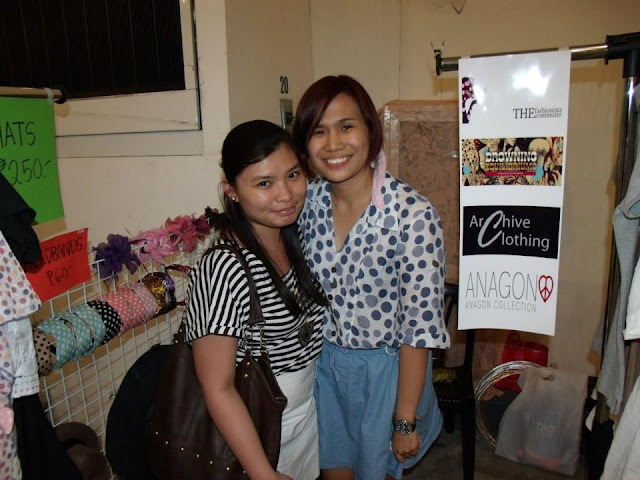 ), plus Aie of aiecorpuz.blogspot.com sold items with us that day! Saturday Lineup: Fashionista Commuter Blog, Drowning Equilibriums Blog, Archive Clothing, Anagon Collection, and In Aie's Shoes Blog! I love these girls forever! And of course, si Athan din...kahit he thinks Zombies kaming lahat that day! ;D Hahaha! Tulog nalang tayo? ;) Hehe! A fellow entrep (and Instagramer! ;)) Jho Tengson! We first met in Supersale December 2011! While all the girlfriends shop till they drop, they left their boys here! Vern and her bro dropped by last Sunday! Not in pic: the milk-white Verniece! Posting my Supersale Bazaar great finds next! But I had the most awesome time! Will never forget the food tripping with Pax, chikahan with the blog barkada and neighbors, and of course interacting with lovely girls who really came all the way to the bazaar just to say hi (and give us a hug! :)) You made me love being a blogger more, and of course, being a tindera! A big thank you and CONGRATS to the organizers of the Supersale Bazaar, to Ms. Kato Chua and JL Ladrido, for this very organized, well-promoted, and successful bazaar! Same with Ava!! Hahaha I went there to support you guys! Super love love love lang! ♥ Bonus na lang ang shopping from (ika nga ni Pax) "temptation island" ♥ Great to see you, friendship! Thank you girls so much!! !